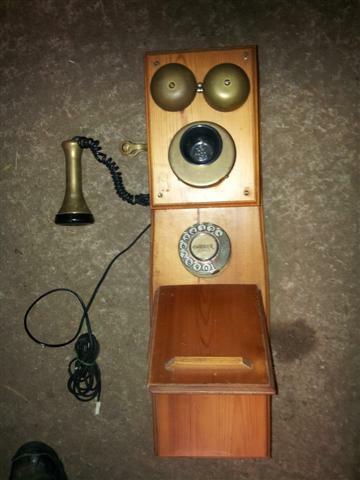 Double box wood wall phone with new brass fittings and a rotary dial known as an Aristocrat phone. This is in a light wood pine version.It has a cupboard below.The wood front left has slight damage and there is a thin split .It could be said that this adds to its patina of age.This was made about 40 years ago. Has a brown plaited cord on the receiver. Has a backboard allowing you to mount it to a wall, ideal for pubs/restaurants/hotels etc or simply as a conversation piece for your home. Comes fully tested and working and with a traditional ringing tone.